It was a very busy weekend for our club Laser sailors. 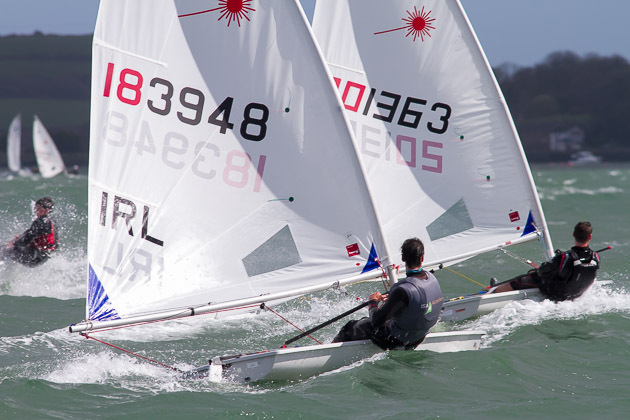 The class had 13 sailors racing in the Irish Laser Nationals at the National Yacht Club in DunLaoghaire, 5 sailors racing in our own Club Cork Dinghy Fest and one sailor racing in the Radial Youth Worlds in Kingston Canada. The Nationals started last Thursday with the heavy winds carrying through to the Friday, the winds eased for Saturday and Sunday. 4.7 Rig: (42 boats). Rebecca O Shaughnessy had a great event, finishing 5th overall and 2nd Female overall in the 4.7 fleet. Chris Bateman finished 11th overall in his first Laser regatta. Tom Keal 29th and Julie Neville 33rd. Henry Higgins (RStGYC) won the event. Radial Rig: (51 boats). Ronan Walsh also had a great event, finishing 6th overall in the very competitive Radial fleet, including 2 race wins! Charlie Moloney 12th, Jamie Tingle 16th, Eoghan O Regan 24th, Tara Coveney 27th, Billy Duane 28th, Richard McGinley 32nd and Luke McGrath 36th. Richard and Luke raced their first Radial event having just moved up from the 4.7 rig. Daniel Raymond from the host club, NYC, won the event. Standard Rig: (19 boats). Richard Thompson finished 9th overall and 1st Youth. Well done to all our sailors, youou did your club proud. On the water support and coaching was provided by David White. RIB was provided by Alistair Kissane. Thank you both. Cork Dinghy Fest 2015; A very successful Cork Dinghy Fest was held in the club over the weekend with 208 boats racing, over four days. It was great to see all the dinghy fleets. We had 5 club Laser sailors competing in the Mixed Dinghy fleet. Billy Duane Snr won this PY handicap event, other club Laser sailors included Sarah Cudmore, Conor O Keeffe, Rory and Sophie Sinclair. Laser Radial Youth Worlds: Cian Byrne was our sole representative at Kingston Canada. Cian finish 29th. Laser 4.7 Worlds: We had 3 club sailors at this event held at Medemblik Holland. Rebecca O Shaughnessy finished 44th in the Girls fleet. Richard McGinley 37th Silver and Luke McGrath 26th Bronze. Hopefully all the club Laser sailors will return home safely and in time to take part in the club “At Home” regatta this weekend. Racing Saturday FG 12.55hrs and Sunday FG 11.55hrs.